I wish you all a wonderful weekend. I have to buckle up and get ready for next week's classes since I was not able to work as much as I would like to during the Spring Break. 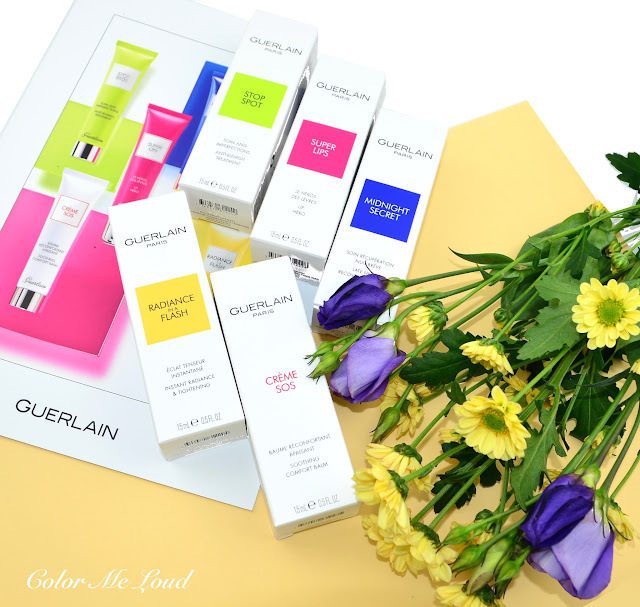 Before I start with that I thought I would like to share my thoughts on a new skin care release by Guerlain. It is a fresh breath, a new idea. I am excited to hear what you think of it too. Guerlain released five new skin care products, each in 15ml sizes and colorful tubes. They are aimed for a variety of issues from dry lips to spots or dull skin and each cost around 29€ in Germany. 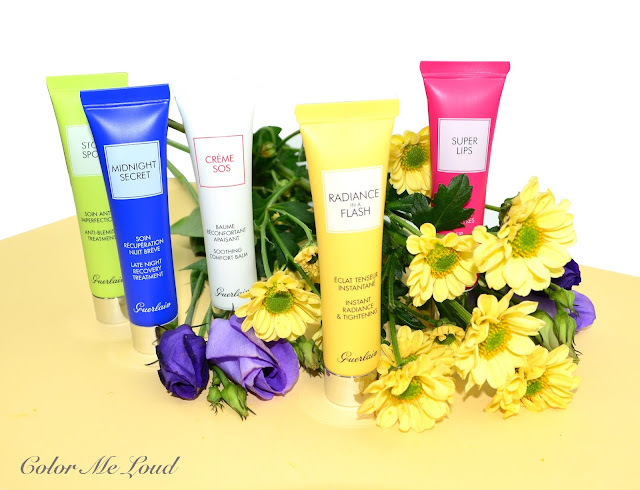 The idea making younger generation familiar with high end skin care while providing the others with handy tubes you can toss in your bag and carry around. I think the idea works in some of the products better than the others. I have been testing them for a few weeks now and here are my thoughts. I really like the colorful packaging, not only because it is so cheerful for that time of the year but also because if you have a couple of those in your handbag, it becomes easier to fish out the one you like. The tubes are tiny and very handy. It is almost like carrying a lipstick with you, from which we all have several. Each tube has a silver cap which is secure ad wouldn't open in a hand bag. Guerlain Super Lips Lip Hero: The one in the pink tube is one of my favorites. Inspired from the cult lip balm Baume de la Ferté, a formula of the brand from 1830s, it is a very rich lip care oil which comforts my lips just with a drop. It is very comfortable to wear as it is not sticky and the effect lasts and lasts. I think the brand should bring out tinted versions of this miracle product. All thumbs up for this one. For your information, it is lightly scented (Bergamot) and contains castor seed oil, jojoba seed oil and grape seed oils and lanosterol esters. It can be worn for the day and at night. 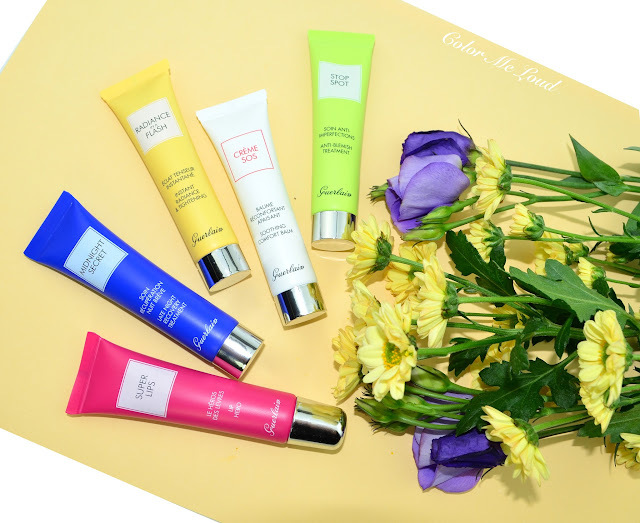 Guerlain Stop Spot Anti-Blemish Treatment: Another favorite of mine, the one in the green tube, is to dab on the blemishes and pimples. It is a recreation of a formula of the brand from 1870s called Créme Camphrea. It has Salicylic Acid for micro peeling and Allantoin for soothing the condition. The consistency is like a full coverage foundation and it has a tint to it too. On my NC20 skin, it matches to my complexion perfectly and covers the redness and the bump. I am having a few skin problem lately so I enjoyed using this instead of a concealer. That said if you are paler than me or much deeper, then it might show up on you instead of camouflaging. Also it is not for using at night because it might stain your pillow. Nevertheless definitely recommended for ladies around my coloring. It cleared up the spots around my forehead very quickly. Guerlain Radiance in a Flash Instant Radiance & Tightening: This is a product I enjoyed using under my foundation as a hydrating base which also lifts up the dullness of the skin with its pearl particles, similar to Guerlain Météorites Base Perfecting Pearls Base (reviewed here) but less shimmery and more hydrating. It has a gel consistency and a tiny amount is enough to apply to the whole face. It gives a very natural radiance and a slight tightening feel to the face. If you are in hurry, you can just add some powder over it to finish with the base. Guerlain Midnight Secret Late Night Recovery Treatment: This is meant to be applied to your face if you couldn't get enough sleep. The formula is one of the cult products of the brand since 25 years. I think this tube is meant to be a sample size of the full size product which Guerlain still has. Since it is meant to be applied to the full face and larger amounts of the product is needed, I doubt you can use it more than 3-4 times. This one is for you if you always wanted to try Midnight Secret out but didn't feel like splurging over 100 bucks for the full size. Guerlain Crème SOS Soothing Comfort Balm: This is especially for those of you who have very sensitive skin with possible redness and itchiness. It is aimed to calm down the skin. I have those issues sometimes during the winter but right now I was not able to test the product properly. I think the small tubes work best for problems which apply to small parts of the face, such as spots, lips and I can see this one working on a part of the face which has redness or dryness. Check out Eugenia's review on four of these products here. She also has swatches. Final thoughts: I really like the idea of small sized skin care to toss in my hand bag as soon as these are aimed to be used at parts of the face, such as lips, spots or dry patches. My favorite is the lip oil Super Lips (miracle almost!) and Stop Spot although I am very much enjoying the Radiance as well. I would love to see the brand extending the range with an eye cream! What do you think about small sized skin care? Can you see yourself using these? I love this concept as well and also loved the lip balm! I tried the midnight secret sort of as a deluxe sample because I've been curious about it. I find it to be a pretty average lightweight moisturizer but not sorry I tried it. Here in the USA we don't have the green one but all the rest are $29. Midnight secret is 15ml and exactly half the regular full size that is $127, don't get the gorgeous glass packaging but great for travel. I have been using is regularly for 2-3 weeks and still plenty left but I layer with other products, so maybe that's why I find it goes further? Rrrrrrreally tempted to try the lip treatment now!